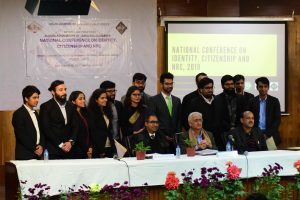 National Conference on Identity, Citizenship and National Register of Citizens organised on February 2nd, 2019 at Engineering Auditorium, Jamia Millia Islamia, New Delhi. For more details, read conference proceedings HERE. The launch of Indian Journal of Law and Public Policy (IJLPP) on 2nd March, 2015 at FTK Centre, Jamia Millia Islamia, New Delhi. The launch was coupled with a discussion on “RTI in India: Applicability and Recent Trends“.